Lovey eyes his nemesis with trepidation. Frances guards a purloined sock. 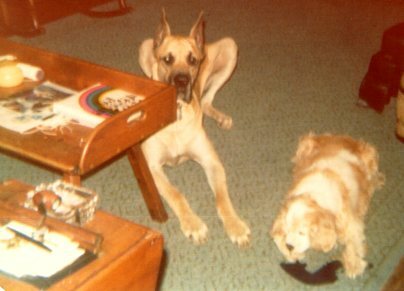 As I narrated in my blog post Crocapuppy , my parents brought home a Great Dane puppy when my brother and I were teenagers, thereby providing our vituperative cocker spaniel Frances with an object towards which she could in perpetuity vent her already considerable spleen. You’ve heard of love objects; Lovey was a hate object. So long as Frances lived, she waged a merciless Reign of Terror against Lovey, restricting his movements by physically blocking his access to this set of stairs or that room and controlling him with a potent and baleful stare that clearly mesmerized him. 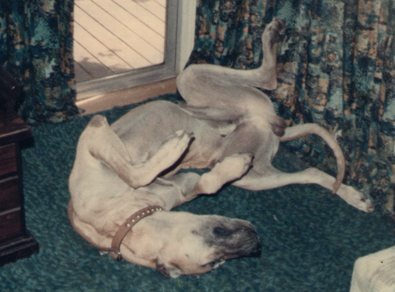 One of my most vivid memories of those years was of Lovey, who stood 6’5” on his hind legs and weighed in at over two hundred pounds, tearing through the house, ears flattened, tail between his legs, with rotund little Frances barreling along in hot pursuit, snarling and snapping at his heels. George Booth’s great cartoon was a favorite in our house. 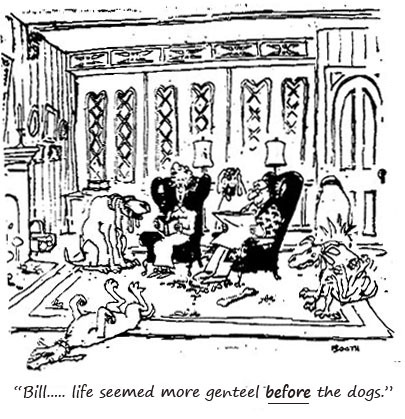 Mom was fond of observing, “Life was more genteel before the dogs.” This might have been true, had there ever been an epoch in our household which could have been described as, “Before the Dogs.” The addition of a gargantuan dog to the mix, however, raised the dearth of gentility to a whole new level. When we ate dinner, Lovey would sit beside my mother, his muzzle poised about two inches above the table, drooling. Anyone familiar with Great Danes will know that their capacity to drool is staggering. A pool of saliva would start to form on the table; this would gradually increase both in volume and in reach, wobbling, viscous and oozing. At some point one of us would be dispatched to the kitchen to retrieve a towel with which to mop up the drool and Lovey would be ordered to lie down. This he would do, his enormous front paws inevitably protruding just a fraction into the area beneath the table – Crocapuppy territory. At this rash intrusion into her domain, Frances would spring into frenzied action, lunging and randomly snapping – more than one ankle was bitten in these nightly frays. At length Lovey would retreat a few feet and Frances, the enemy repelled, her borders once again secured, would subside back into a seething heap of grrr-ing menace. The Urban Dictionary defines the verb “snorfel” as “the act of holding someone close and inhaling their scent at the base of their neck;” it dates the word’s usage to 2009. In this, the Urban Dictionary is mistaken. My mother used that word at least as far back as 1970 to describe the way a dog greets you when it sticks his or her face in yours and performs some perfervid combination of sniffing, snuffling, snorting and mush wiping. Lovey was a master snorfeller; he just stuck his big old jowly face in yours and had at it. For all the years that he and I shared my parents’ home, Lovey snorfelled me awake. “Go wake up Sister,” my father would say. Moments later, Lovey would poke his nose through the crack in my bedroom door, lope over to my bed, stick his face in mine and snorfel me into consciousness. People who live in horror of dog germs will find this alarming, but we survived, some of us to a very great age, and counted ourselves lucky that Lovey had not proved a licker, given the Slobber Factor. Out back of our house was a fenced in area for the dogs to do their business in. During Frances’ solo turn, it had remained a pleasant enough idyll, with a ground cover of grass and ivy and several mature camellia bushes that were beautiful in bloom. Then Lovey arrived on the scene. There comes a point in every dog’s life when it must take pills and that point for Lovey coincided with the time I left Chapel Hill for graduate school in Toronto. When I returned home for Christmas, I went to my closet to don a pair of pinkies I had left there – these were the fuzzy pink slippers that were my mother and my preferred footwear – only to find a hard lump of something peculiar wedged into the toe end of each slipper. I shook the slippers and two lumps of hardened, congealed dog pills fell to the floor. After some deliberation, we realized that Lovey had only pretended to swallow the pills my father doled out to him, then sneaked into my bedroom and spat them into my pinkies, where, over the course of my absence, they had accreted into their present iteration. This sleight of mouth on Lovey’s part gave me new respect for the Great Dane, who had never struck me as but so bright. Clearly Crocapuppy’s lessons in guile had not gone entirely unheeded. I always said that I didn’t want to be within a one hundred mile radius of Chapel Hill when Lovey died. I couldn’t bear to witness my parents’ terrible grief. 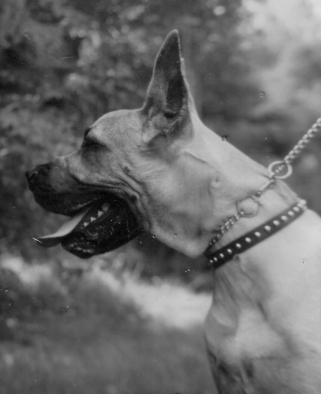 As it turned out, I was in Toronto when he passed and my parents’ grief was indeed terrible … until the following day when they went out and bought another Great Dane, black this time and named Tennessee’s Waltz. And with that, a whole new era commenced, the chronicle of my family being divided into epochs not by the ascension of Presidents to office or kings to thrones, but by a succession of dogs. How delightful and thank you for the kind words! I will tell Dad that I heard from you and he will be so pleased, as will Michael, who’s now the head of the Outdoor Drama Institute in Greenville, N.C. and is getting married (for the fourth time!) on May 12 down in Mexico. We’re just getting ready to head down.